Home / SkinCare / ZEOS For Men QU3 Expert Defence Skin Care Range. ZEOS For Men QU3 Expert Defence Skin Care Range. ZEOS For Men QU3 Expert Defence Skin Care Range, ZEOS first new line urban defence system for the male face and body. This is a pared-down, stunningly fuss-free range that is powered by a high tech blend of Resistem™ with natural vitamins E and B5, in sharp, contemporary packaging. The Award winning ZEOS® QU3 range with Resistem™, A 21st century defence system unifying the latest technologies to create a layered resistance to keep your skins enemies at bay. Everyday your skin is bombarded daily by pollution, whilst also being stressed by other factors such as convenience foods and living a fast paced life. ZEOS® believe in solutions and in bringing you products made for men who want to look great. whilst being hassle-free as possible. ZEOS For Men QU3 Expert Defence Skin Care Range consists of three primary defences: face & body moisturiser. face scrub & face wash and hair & body shower gel. Each product all effectively combine to protect your skin throughout the day. Resistem™ is one of the ingredients in each of the products, a remarkable natural ingredient recently discovered and exploited using plant cell technology obtained by the stem of Globularia cordifolia plant mimicking the skin's own defence mechanisms thanks to a natural hormesis-like mechanism. The QU3 range is bursting with naturally powerful vitamin E antioxidant and a collagen stimulant to give your face energy, vigour and glow. Natural vitamin B5 keeps skin and hair hydrated along with shea butter infused moisturiser adding important nourishment and suppleness to the skin. ZEOS For Men QU3 Hair & Body Shower Gel. ZEOS QU3 Hair and Body Shower Gel with Resistem™ Removes dirt, excess oils and odour from your skin and hair helping you to feel squeaky clean and fully energised. Bursting with natural Vitamins to help you feel refreshed, re-energised and ready for the day ahead. How to Use: Take into the shower with you and lather up onto wet skin, then proceed to rinse off. The gel has a skin loving consistency and only using a little, this lathers up really well. A masculine fragrance can be detected that will invigorate your senses whilst the gel will hydrate and nourish your skin, a revitalising daily boost much needed! 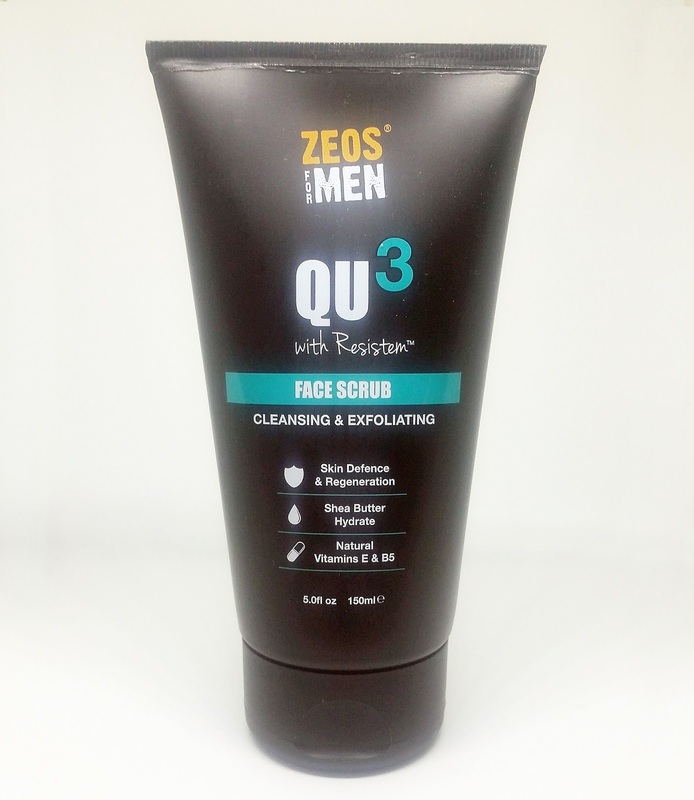 ZEOS For Men QU3 Face Scrub. ZEOS QU3 Facial scrub with Resistem™ and coconut husk gently exfoliates the skin, naturally removing dead cells and dirt. Providing a self-defence for the skin leaving your face feeling rejuvenated, fresh and smooth. Natural Vitamins E and B5 help you feel freshly balanced and hydrated. How to Use: Lather up a plum sized dollop in your palm, close your eyes and work gently into wet skin. Splash with luke warm water to rinse and pat dry. Including a face scrub into your skin care regime is an effective product to use, removing dead skin cells to help skin turn over for a healthier appearance. Also using a face scrub before shaving will help you achieve a more closer shave whilst also preventing any nicks or cuts. The face scrub feels creamy whilst also feeling a little gritty thanks to its coconut husk (no micro beads) and will leave skin smooth and hydrated when washed off, a cleanser and exfoliator in one! 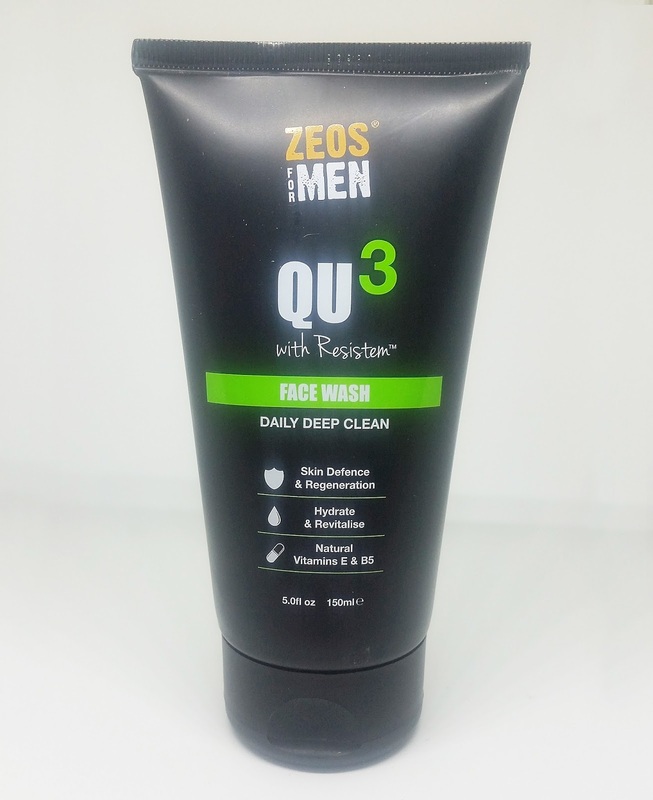 ZEOS For Men QU3 Face Wash.
ZEOS QU3 Face Wash with Resistem™ First-line defence that helps regenerate your skin’s natural glow by cleansing deeply into the pores. Natural Vitamins E & B5 helps the skin to feel fresh, clean and invigorated. How to Use: Lather up in your hands and massage into your skin. Rinse off with lukewarm water and pat dry with a towel. The face wash is clear in colour and has a gel consistency that glides over skin and lathers up extremely good. Leaving the face wash on for about a minute before rinsing off will allow it to get to work in your pores, a daily deep clean face wash that will help regenerate your skins natural glow. 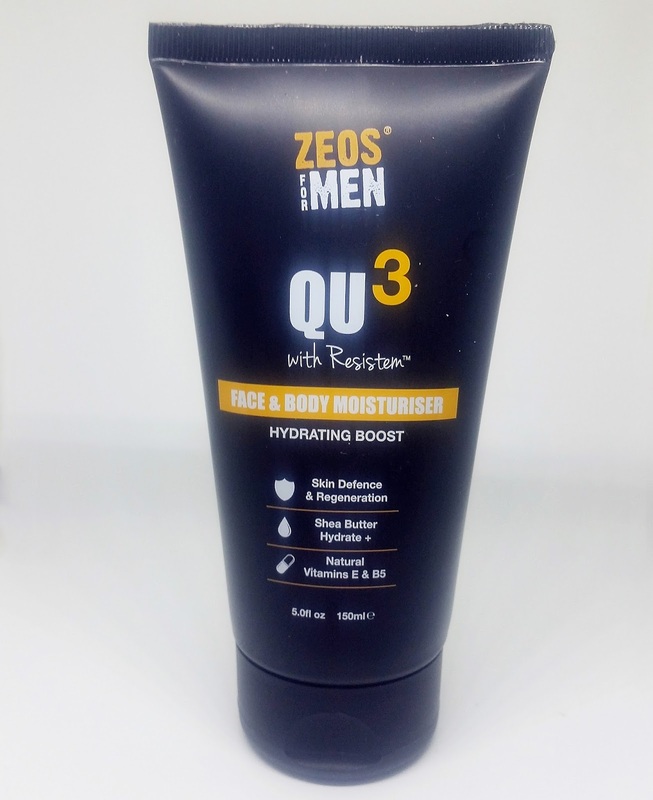 ZEOS For Men QU3 Face & Body Moisturiser. ZEOS QU3 Face and Body Moisturiser with Resistem™ Powered by natural Vitamins E and B5 this is your everyday defence against dry skin by keeping it hydrated and smooth for a youthful appearance that’s full of energy. How to Use: Simply apply the face and body moisturiser into your skin and feel the hydration protect your skin. White in colour with its medium consistency (doesn't drip) but feels lightweight, when working into your skin in circular motions. Your skin will feel hydrated but not feel greasy or sticky, a welcomed hydration boost for any skin type. Each product from the ZEOS For Men QU3 Expert Defence Skin Care Range fulfils an important key role your looking for when choosing a skincare range to buy. Revitalise, Exfoliate, Deep Clean and Hydrate covers all the basic steps that should be in your skincare regime. The eye appealing packaging offers easy to read directions whilst also being in squeezy tubes, so u can use all of the product inside. The ZEOS For Men QU3 Skin Care Range is great for beginners and teenagers looking to start a skincare routine, whilst also being great for the any man who wants hassle-free, easy-to-use products that work everyday looking after your skin. Check out the award winning Skin Care Range at Zeos For Men. Enjoy, Neil.